If you’re not a runner in Nashville, it’s time to change that. Nashville has no shortage of incredible running paths from pedestrian bridges to greenways to Downtown destinations. All of which offer an incredibly unique and beautiful perspective of the city. Here are our seven favorite running routes that’ll surely get you off the couch and out into nature. If you’re an East Nashvillian, chances are high that you’re familiar with Shelby Park. But for those that don’t venture over to the East Side very often, you need to (and not just for the plethora of amazing restaurants). 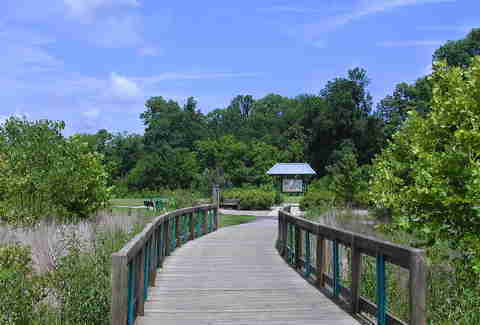 Shelby Park is a gem that’s filled with various paths and a greenway trail that’s eight miles from end to end. If you start at the Nature Center, it’s a 3.3 mile run to the Cumberland River Pedestrian Bridge. You do have to climb your way up a steep incline to get to the top, but you can consider that your cool down before enjoying the great view atop the bridge. Bonus points if you make it out as far as Cornelia Ft. Airpark. Percy Warner Park is Tennessee beauty at its absolute finest. 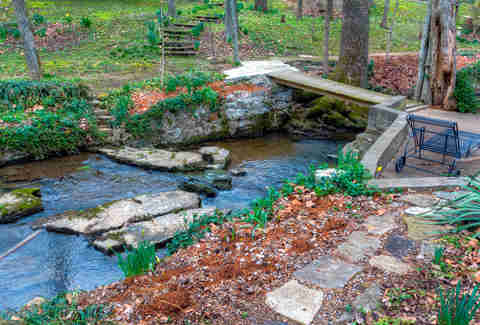 One of the most popular ways to run this park is to start at the Belle Meade entrance so that you can begin your workout with a run up the iconic Warner Park stone steps. This is a great option if you’re looking for a scenic route for your longer runs, or somewhere to do a bit of trail running. Percy Warner offers several paved and primitive trails with a trail that connects it to Edwin Warner Park. If you run both of the parks, you’ve got a grand total of 12 miles of trail options. In case you simply love running stairs and the stone steps at Percy Warner Park weren’t enough for you, the Tennessee State Capitol steps are another runner's favorite in the city. There are steps going up the left and the right sides of the Capitol as well as a good set up stairs to run down on the back side of the building. So if you’re looking for a killer workout (that also has a beautiful view), the Capitol stairs are where it’s at. 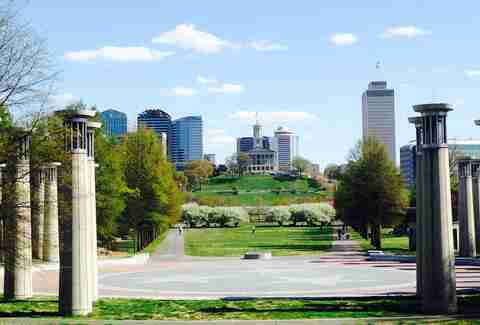 And if you want to get a bit more of a run in, you can always jog down to Bicentennial Mall and past the Farmers' Market for a scenic view of the city. 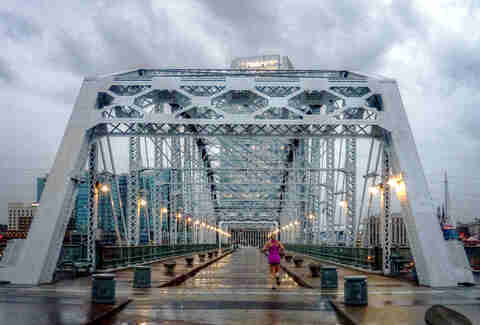 Running over the Downtown Pedestrian Bridge and through Riverfront Park is a right of passage for true Nashville runners. Fun fact: this bridge is officially called the John Seigenthaler Pedestrian Bridge and before that it was named the Shelby Street Pedestrian Bridge... but no one really calls it either of those. In Nashville, it’s just the ‘Downtown Pedestrian Bridge,’ and we love it. The city has been doing a lot of work over the past few years to greatly improve the Riverfront Park area and it’s now easily one of the most beautiful spots to go for a run in Nashville. 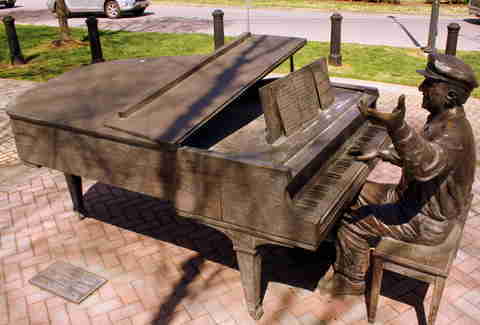 A popular route among many Nashville runners is one that involves looping around the Musica Statue (often referred to as the “naked dancers statue”). A particularly beautiful route -- with lots of great buildings and old houses to look at -- starts on Belmont Blvd and goes up through Music Row, looping around the Musica statue at the end. If you’re coming from the East Side, there’s a popular run that starts in Lockeland Springs, goes across the Downtown Pedestrian Bridge, before it eventually hits the loop and then heads back to East Nashville. 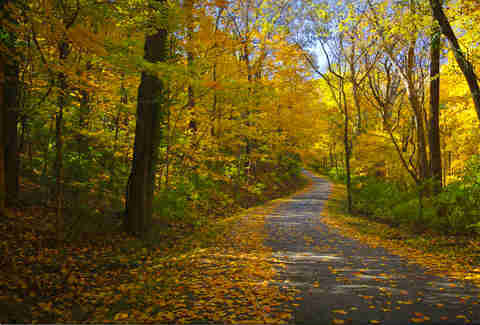 The Ellington Agricultural Center has several trails that are great for runners. The main trail that loops all the way around the agricultural center is just 1.6 miles, making it the perfect path for those looking for a simple and short run without sacrificing any of the beauty you’d see on a longer trail. Bonus: you can make a stop at the agricultural museum on your way out, so if you have some kids, bring them along. Centennial Park is easily one of the best people-watching spots in the whole city. But also, a beautiful running route. 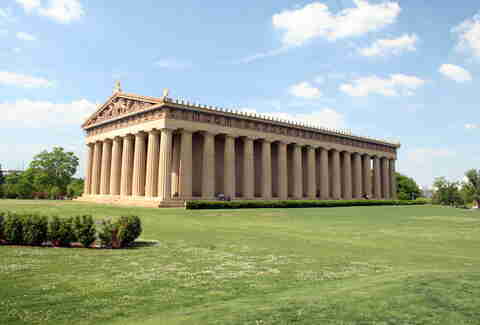 The trail is only a mile long, but it weaves in and out between the Parthenon, the lake, and the gardens -- making this one a favorite of newbies looking to break in their new shoes. Brita Britnell is a Nashville native food blogger and photographer who loves running but only in small doses.